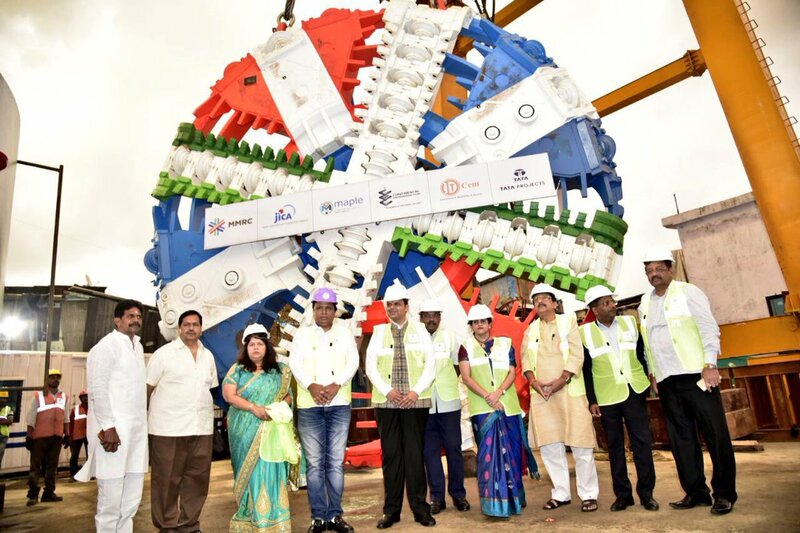 Mumbai: The Chief Minister of Maharashtra, Shri Devendra Fadnavis, on Thursday, witnessed lowering of the first Tunnel Boring Machine (TBM) for the Colaba-Bandra-SEEPZ Metro-3 corridor at the launching shaft in Naya Nagar, Mahim. The highly-mechanized Earth Pressure Balance (EPB) machine procured from a German major Herrenknecht AG, manufactured at its facility in Guangzhou, China, will be used to construct twin tunnels with circular cross section. The total depth of this shaft is 25m out of which 16m is in hard rock. The front shield, middle shield, cutter head, erector, screw conveyor and tail-skin shield and other different parts of the machine will be assembled to form a 110m long TBM to construct the 2.5-km long tunnel between Naya Nagar and Dadar stations. “It was very exciting to witness the lowering of the first TBM for Mumbai’s first underground Metro corridor”, said Shri Fadnavis. “This showcases the speed with which the work on this corridor is progressing. This green mass rapid transit system will not only help improve environment but also go a long way in reducing traffic on roads and congestion in suburban rails”, said Shri Fadnavis further. “Metro corridors are the need of the hour for Mumbai and we are committed to complete the project as per schedule”, said Ms. Ashwini Bhide, Managing Director, MMRC. “The TBM will start its boring operations in the fourth week of October. The MMRC, General Consultants, Contractors and the team of experts including expats– buoyed by the presence of the Hon. Chief Minister – will ensure the smooth operation inside the shaft”, concluded Ms. Bhide.